I am not fond of impostors. In fact, they tend to piss me off. When frosting is described as “buttercream”, when high fructose corn syrup is labeled “healthy” and “good for the environment”, or when puff pastry is called a “Danish”, my eye starts to twitch. Right about now you might be questioning my sanity, but hey, I’m passionate. I actually saw a video where a woman was making Danishes using biscuits in a can, I kid you not. I didn’t make it to the end, because I ended up blacking out from shock. So now that we know what a Danish is not, let’s talk about what it is. It a butter-laminated (as in many layers of it) dough with some kind of filling be it fruit, cream or cheese. It is very similar to croissant dough, only it has a tiny bit more sugar and has yeast to aid its rise. Cinnamon rolls are typically made using a Danish dough. And I know you’ve all had one of those before. As a child, the smell of them frequently functioned as my alarm clock. So, if you are craving a flaky yeasty buttery layered pastry filled with all kinds of delicious goodies, then make a Danish. Shortcuts does not a Danish make. It’s time to pony up. It’s actually not that difficult. Takes a bit of time, but pretty easy and always worth it. Plus a batch always yields enough to freeze a bunch for those days when you might not be feeling so industrious. 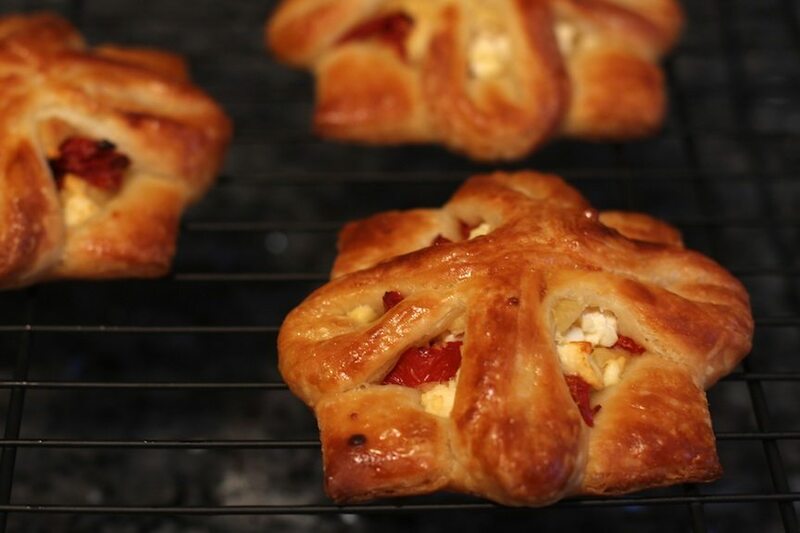 And so it was, hummus danish with feta cheese and sun dried tomatoes. First make the egg wash, which will be our glue to hold the Danish together as well as coat the pastry to provide a golden brown exterior. Combine 1 whole egg, 1 egg yolk, a pinch of salt and sugar, and a splash of water. Whisk to combine, and set aside. 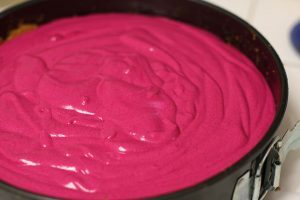 Roll out the chilled dough to slightly thicker than 1/4″. If you have a specific shape in mind, then at this point have at it and hack up the dough and fill as you see fit. Otherwise, here’s an option. 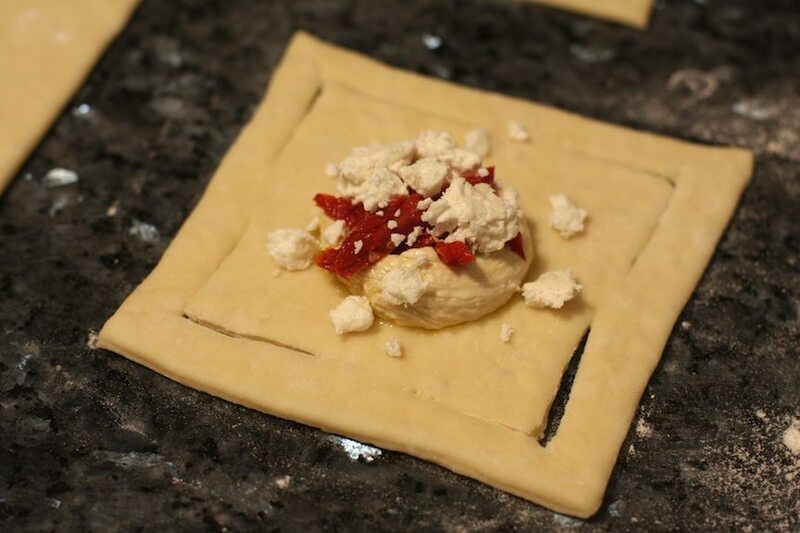 Cut your dough using a pastry wheel, pastry cutter or a sharp knife into 5″ x 5″ squares. (NOTE: If using a knife, do not drag the knife to cut the dough as it will tear and snag. Press down to cut, lift up and move along as needed.) For additional pictures depicting how to cut the dough and assemble the pastries, check out all the photos for this post on the Facebook fan page. Fold one corner over to the opposite side to form a double-layered triangle. At the corner of the seam, make an L-shaped incision cutting through both layers of pastry. Open it back up to a square, and fold the opposite corners together. Repeat the incision. Open the pastry back up. It should look like almost like a picture frame with slits in all 4 corners. Place a dollop of hummus in the center. I drop hummus into a ziplock or pastry bag and pipe it onto the pastry. Easier and less messy that way. Top with feta and the tomatoes. Place one more dollop on top of the toppings. Bring the first corner in and press it into the hummus. Put a dot of egg wash on top of the corner for glue and proceed with the remaining corners, until you have a neat package. 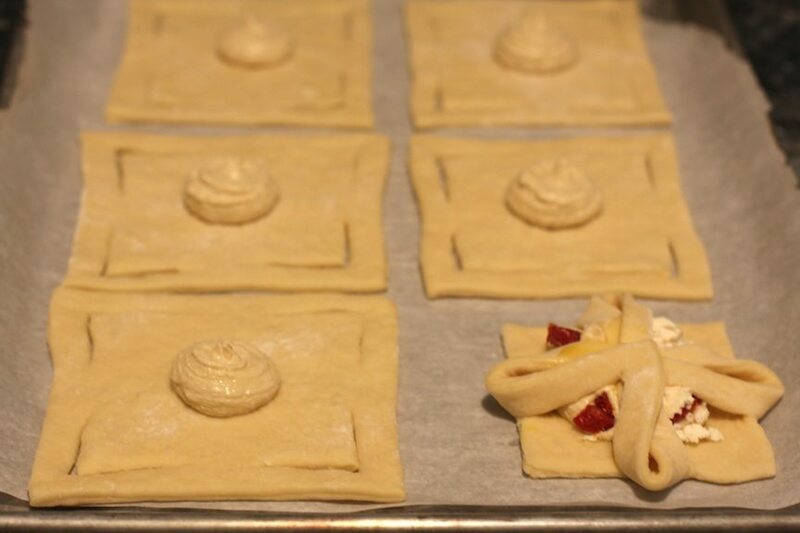 Once you have all of your pastries assembled, preheat your oven to 415F and let them rise in a warm place until half-doubled. Lightly glaze with the egg wash and bake for 8-12m until golden brown. I couldn't download as well. 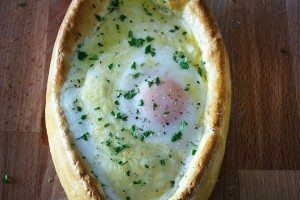 Is there another way to get this recipe? 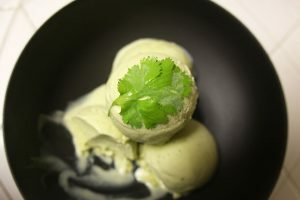 I’ve updated the link within the recipe as well. Sorry for the hassle!